Ubiquitous systems change the way users interact with computers, because their services must be available everywhere at any time, supporting users in various everyday activities. An essential element for these systems is their calm interaction with users, which means the system should not disturb them unnecessarily. Literature currently lacks work focusing on how to evaluate calmness and case studies made in a real usage situation. 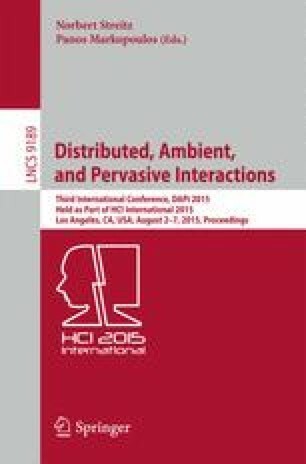 The aim of this work is to propose a model, defined using the Goal-Question-Metric (GQM) method, for calmness evaluation in ubiquitous systems and to show our results from a case study with three ubiquitous applications. This work is a result of Maximum project supported by FUNCAP and CNRS under grant number INC-0064-00012.01.00/12. R.M. Carvalho—PhD Scholarship (MDCC/DC/UFC) sponsored by CAPES. R.M.C. Andrade—Researcher scholarship - DT Level 2, sponsored by CNPq. We would like to thank the Software Quality and Testing Cell (CTQS) of GREat for the technical support that they provided.